Berridge, Celia. Very Good. 48 p. Viking Kestrel picture books . Colour illustrations. Intended for a juvenile audience. 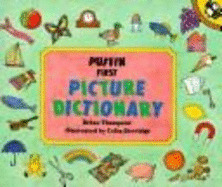 This dictionary aims to clarify the meanings of words by the use of illustrations, drawn by Celia Berridge of Postman Pat fame. Designed for use by parents and teachers with the beginner reader, it is written by the educational consultant for the "Happy Family" series, Allan Ahlberg.